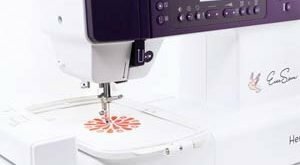 Review of Janome HD1000 Heavy-Duty Sewing Machine - Good Buy? 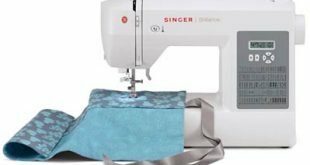 This review will give you ample reasons to either contact the nearest sewing machine distributor for a Janome HD1000 or better still buy at Amazon. Janome HD1000 is referred to by many as one of the most powerful home sewing machine available in the market today. I see it as a fusion of the old with the new. It combines the long lasting nature of old sewing machine in addition to the sophistication of a 21st-century machine. 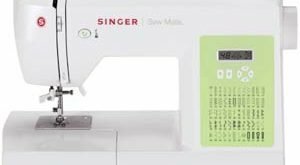 Many sewing machines are referred to as a workhorse or a beast for the sake of marketing; this is not the case for Janome HD1000. It will endlessly keep on powering through your fabrics until you are tired of feeding it, or when there’s no more to sew. In buying a heavy duty machine, it is pertinent to consider the portability, usability, versatility, and durability. These are all the watchword of the Janome HD1000 sewing machine, weighing over 20 pounds, and always ever ready to handle large projects. Whether it is leather or layers of denim, Janome HD1000 will outstandingly handle it without squeaking. As stated earlier on, Janome HD1000 is a combo of the past and the present. This is visible with the winding of the bobbin; you will have to withdraw the needle through turning of the motion dial situated in the interior of the hand wheel (one-half turn). So also, adjusting the tension is via a manual dial. In choosing from any of the available basic stitches, dialing any of the 23 desired stitch number does the magic. It delivers a quality and excellent stitch. The machine also has a needle threader. You won’t need to be cutting your threads; it automatically does it. The needle plate is also made simple with the engraved seam guides. The extra high presser foot allows for easily stitching through many layers of thick materials You also have extra space at the arm to accommodate the extra length of fabrics. 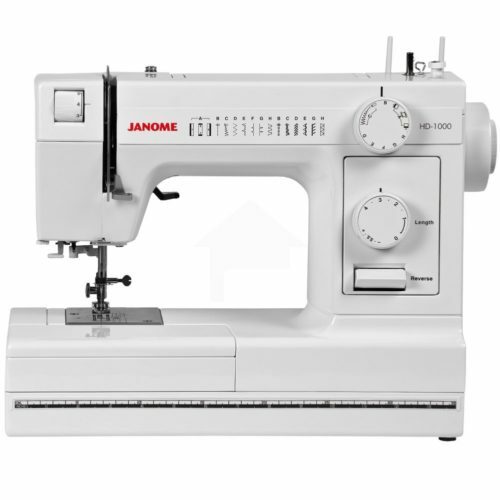 Janome HD1000, unlike other sewing machines, threaded from the right to left, reverse is the case for this machine. No one would expect to find a decorative stitch on a heavy-duty machine; this would have been the weak point with the absence of the frills many individuals look out for in a new machine. Nevertheless, Janome HD1000 delivers on the essential features it possesses. Who should buy Janome HD1000 Sewing Machine? If you belong to the large group of sewers who are not freaked by decorative stitches, the Janome HD1000 is the right buy for you. If you intend to tutor your children on the basics and rudiments of sewing, you are buying the right sewing machine if it’s Janome HD1000. Whether you are a sewer with experience that dates way back to the 1970s or a newbie, the Janome HD1000 is a generation Bridger. If what you need is a sewing machine that won’t skip stitches and doesn’t have problem with heavy duty fabric that light weight machines do have, Janome HD1000 may be the answer.